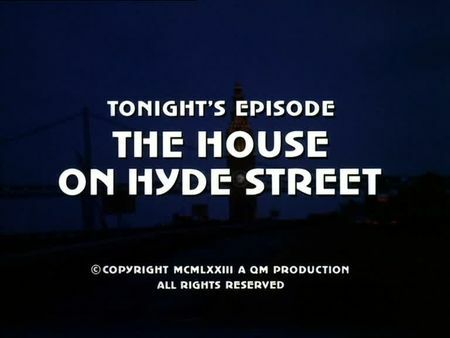 The screencaps for The House on Hyde Street are now available on the episodes' page. Three young boys sneak into an eccentric old man's home, an eldritch house rumored by their parents to contain a million-dollar treasure and a mystery concerning the old man, Harlan Edgerton, and his brother, Donald, who allegedly had killed a neighbourhood girl and passed away 30 years ago. The three boys discover the house to be full of stacked newspapers and collected trash, however, an opening door leads them to run away but one of them does not make it out of the house. Mike and Steve are investigating the boy's disappearance, and are soon confronted by the other boys' parents with the old mysterious story of the Edgerton brothers. The two boys, however, do not say a thing about their break-in in fear of consequences, so the investigation turns out to be rather difficult. We as the audience learn that the old man's brother is still alive when Harlan finds the boy's dead body in his brother's room. When he tries to bury the dead body in a corner of the Golden Gate Park, Harlan is being caught and arrested by Stone and Keller who are already on his trail. In the meantime, some neighbourhood parents are taking the law into their own hands, so Mike and Steve need to hurry. In a rather uncommon move, and supported by District Attorney Gerry O'Brian, Mike confronts the two boys with Harlan Edgerton and the actual tragic fate of the two brothers. The boys finally tell the truth, so our two cops can prevent a false self-administered justice. This episode is supposed to take place on 'Hyde Street', which is located in the Nob Hill district towards Fisherman's Wharf, however, the actual filming was accomplished in Potrero Hill again. The Edgerton's mansion is located at 300 Pennsylvania Avenue (at 18th Street), whereas the roof top scenes were taken two blocks away on another house at the junction of 18th and Texas Streets. While the boys are sneaking into his house, Harlan buys some food in a local market at 1301 18th Street - which actually is the building used for the roof top scenes as well. Following the discovery of the boy who died after falling down the roof top staircase, Harlan takes the dead body to Golden Gate Park, and we also see an alternate exterior view of the SFPD headquarters in this episode. Finally, Mike confronts the two boys with Harlan Edgerton at 20th and Mississippi Streets. As a sidenote: in opposite to many other episodes, and although the building seemed to be in a condemned condition at that time, the indoor scenes for the Edgerton mansion were obviously not filmed inside the actual house at 300 Pennsylvania; when Mike and Steve are standing in the door in order to stop the other boys' parents from destroying the mansion, we can see a large skyline canvas waving in their background, so it might have been a studio stage sequence.